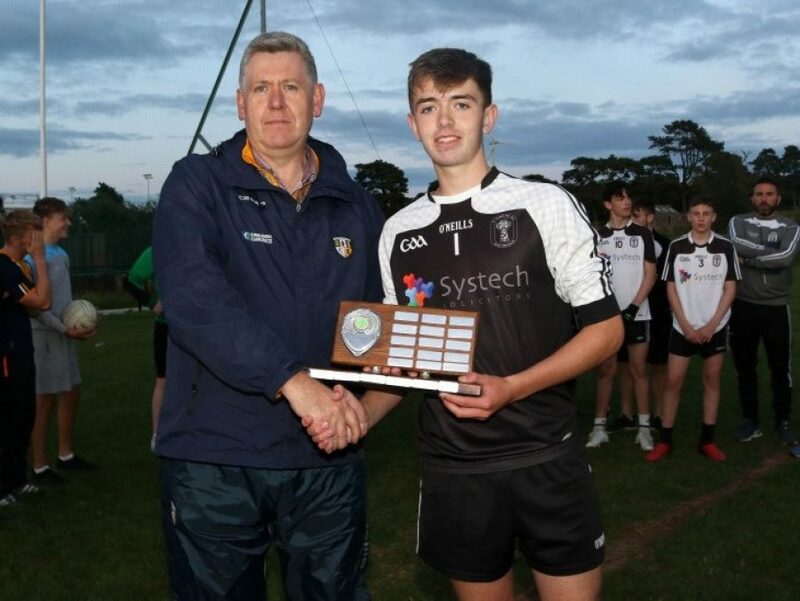 Report and pics by Saffron Gael South West Antrim Og Sport Finals What has been a great week for All Saints GAC, Ballymena continued tonight when they hosted the final stages of the South West Og Sport football finals at Slemish Park. 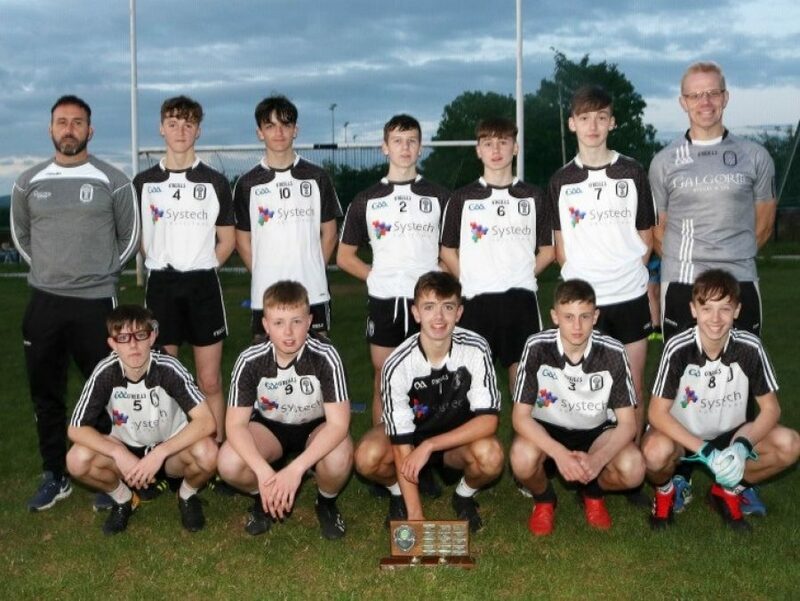 Following the previous round in Toome last Saturday, six teams had qualified for tonight’s play-offs with the home side joined by Erin’s Own, Cargin, Tir na nOg, Moneyglass, Creggan and St. James’ Aldergrove. 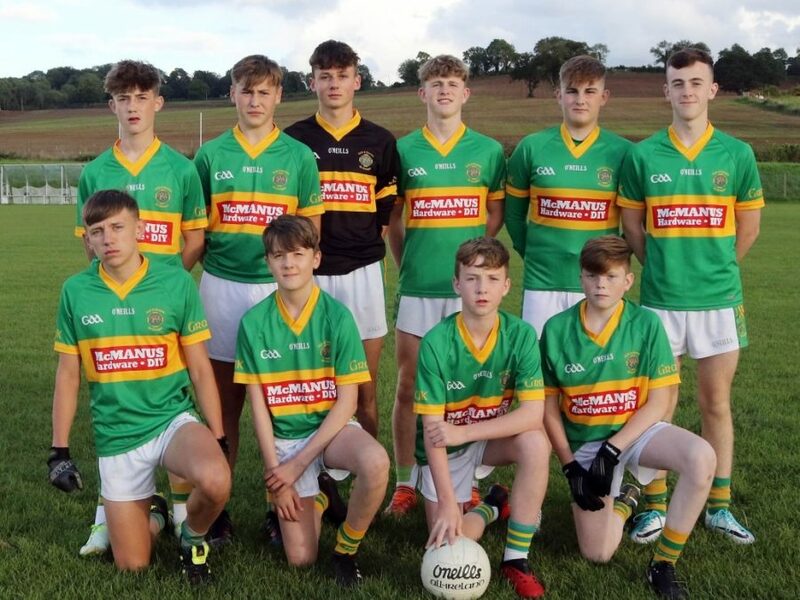 St. Ergnat’s Moneyglass faced neighbours; Kickham’s Creggan in the first quarter-final, the winners would meet Erin’s Own, Cargin in the semi-final. In a great game of attacking football the sides couldn’t be separated at the end of eight minutes each way , the game finishing Moneyglass 2-4 Creggan 1-7. In a nail biting four minutes each way extra time Moneyglass emerged winners by the narrowest of margins, 1-3 to 1-2. 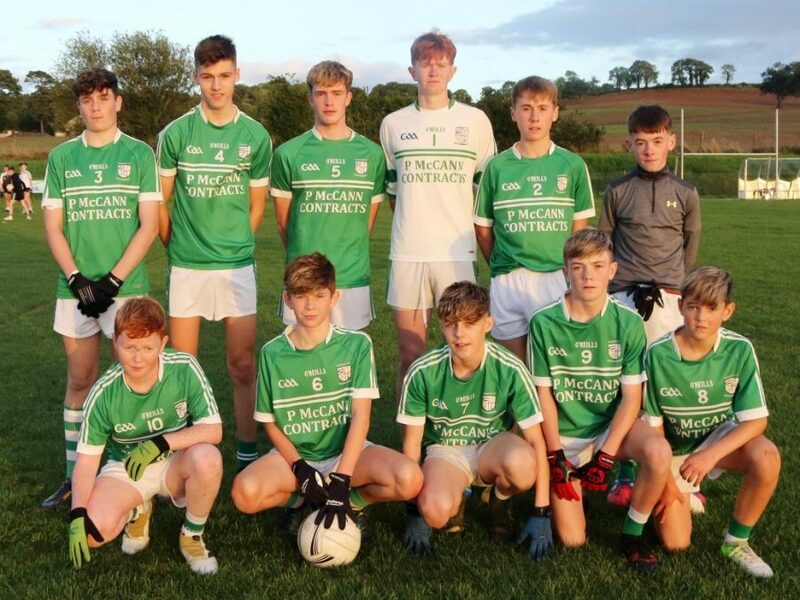 Charlie McCloskey led the St. Ergnat’s scoring charge with 2-0 and Aiden McErlain 1-4, Seanie McIntosh 0-2 and Tiernan McCormick 0-1 were the other Moneyglass scorers. 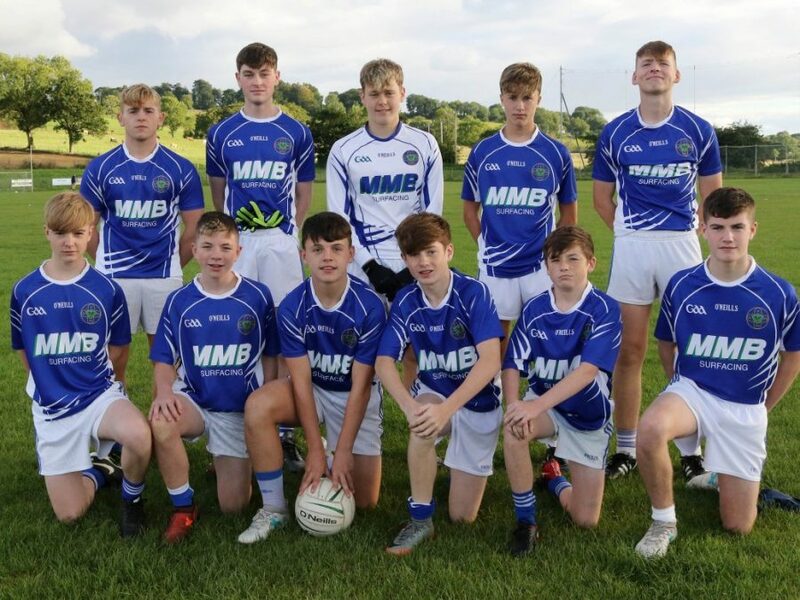 In the second semi-final St. James’ Aldergrove looked to be heading for a semi-final meeting with All Saints when they led Tir na nOg, Randalstown 1-2 to 0-1 at half time but the Whitehill side battled back brilliantly in the second half to run out winners, 1-4 to 1-3. Shane Hinfey got the Tir na nOg goal while Conor Hastings 0-2, Josh Higgins 0-1 and Daniel O’Neill 0-1 completed the scoring for the Randalstown side. Eoin Gough got the Aldergrove goal and their points came from Logan Fleming 0-2 and Daniel Shields. There was little respite for the winners of the quarter-finals and an already tough task was made more difficult by the fact that their respective opponents had already qualified for the semi-finals and were starting with fresh legs. 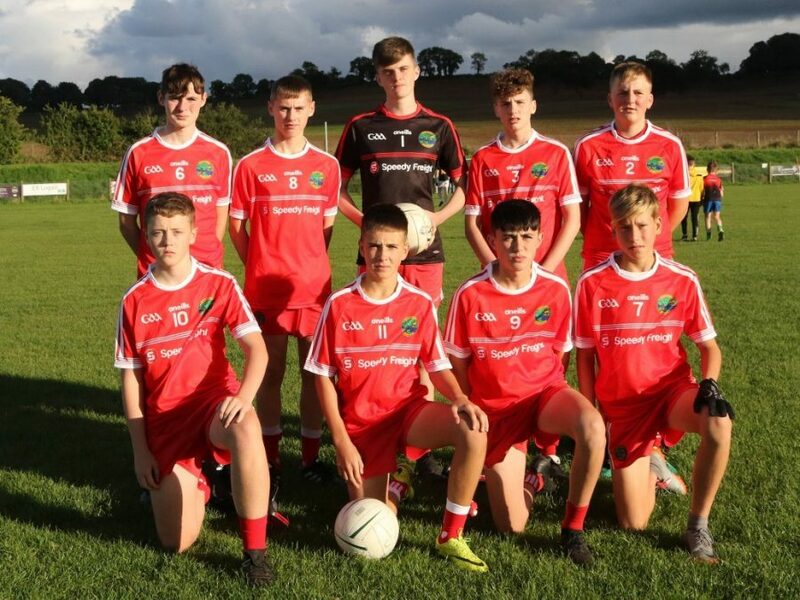 In the first semi-final Tir na nOg faced a strong All Saints side; its entire starting seven had been in action on Sunday night when they defeated St. James’ Aldergrove in the Breslin Cup final and their confidence was obviously high after that famous win. All Saints had an ace card in keeper, Harry Wylie who at every opportunity soloed forward to join in attack and his clever movement played a big part in his side’s victory. All Saints first four points came from fisted efforts close to goal but they still looked to have a bit to do at the turn over. Eventually though their greater team work and physicality wore down a courageous Tir na nOg as they ran out winners 1-9 to 1-3. Jimmy Montgomery top scored with 1-2 while Shaun O’Callaghan 0-4, Harry Wylie 0-2 and Ronan McKillop 0-2 completed the scoring. Conor Hastings 1-2 and Alex O’Donnell were the Tir na nOg marksmen. On the second pitch Erin’s Own Cargin proved too strong in the end for a Moneyglass side who had given everything in their victory over Creggan and at half time the Toome lads were in the driving seat as they led 3-1 to 1-1. The St. Ergnat’s lads never gave up but heavy legs began to take their toll as Cargin ran out 4-4 to 1-2 winners. The impressive Tom Shivers top scored for Erin’s own with 2-3 while Eunan Quinn 2-0, and Ben McLarnon 0-1 were their other scorers. Seanie McIntosh got the Moneyglass goal while the excellent Aiden McErlain got two points, one from a ’45’. And so it was down to the final where All Saints faced Erin’s Own in what looked a very even pairing but it was the Slemish Park side who grabbed the early initiative to take control. Harry Wylie stepped up-field from goals to dispatch two early frees between the sticks and a couple of fisted efforts from Shaun O’Callaghan put them in the driving seat at half time when they led 0-4 to 0-0. Cargin’s cause certainly wasn’t helped when they missed a couple of frees of their own but they battled away in the second half but found it hard to break down a well organised All Saints defence. The Ballymena lads didn’t score in the second half but managed possession well and Cargin’s only reward came from a pointed Tom Shivers free. An excellent evening’s entertainment, well organised by Colum Walsh and his team who ensured that the games ran like clockwork. There was a lot of good football played by all the sides in attendance and football and good sportsmanship was the real winners with not a dirty tackle or a controversial incident all evening. 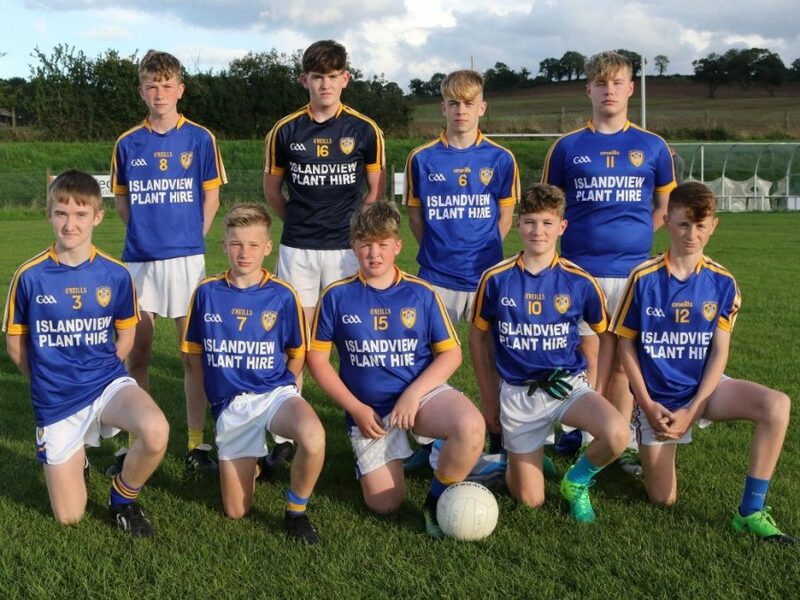 All Saints now go forward to meet Davitt’s in the All County final on Sunday in a fixture that will be the first of a double header followed by the Laverty Cup final where the Ballymena side face Tir na nOg.